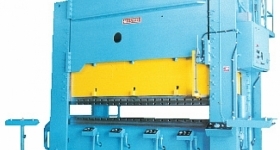 The heart of the ALLSTEEL hydro-mechanical straight side press is the mechanical linkage system. 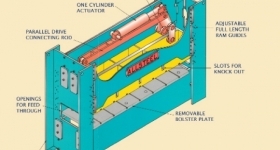 Using only one hydraulic cylinder, the linkage allows all the benefits of hydraulic drives, such as variable stroke, variable speed, variable tonnage, and overload protection, while avoiding the need for expensive failure-prone hydraulic balancing systems required by conventional multi-cylinder hydraulic machines. The ALLSTEEL system uses Fiberglide® lubrication-free bushings and hardened pivot pins for a long, maintenance free life. 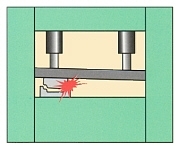 The connecting rod, loaded in tension, assures parallel movement of the ram regardless of off-center loading. Two-point linkage support combined with eight-way gibing assures precise ram movement and repeatability. Machines with ram bolsters wider than 48" are equipped with four point suspension to assure parallel operation with loads offset front to rear as well as left to right. Other substantial benefits of the ALLSTEEL system include low headroom design and shock-free operation due to the inherent damping action of hydraulics. The machines are safer, because there is no high energy flywheel. 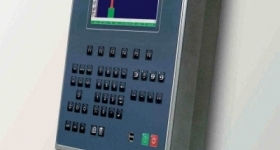 The machines require low maintenance, as there are no gears, clutches, brakes, pitman, or sensitive servo systems and other high-maintenance items. Finally, they are a great value. 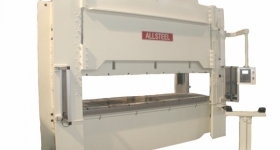 ALLSTEEL has over 50 years of experience in the construction of hydro-mechanical presses. This track record, combined with superior resale value and low initial investment, is unsurpassed in the industry.